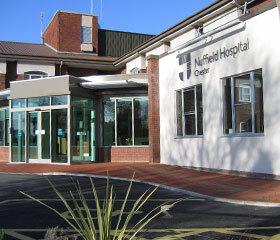 Mr Banim consults privately at the Grosvenor Nuffield Hospital, Chester. Appointments can be made directly with the hospital using the dedicated appointments phone number listed below. A referral letter from your GP is usually required. Mr Banim is part of the Orthopaedic Department at the Countess of Chester. He has regular elective clinics on Wednesday afternoon, and fracture clinics on Thursday morning.